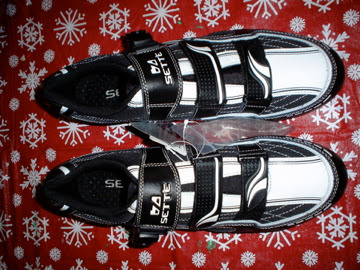 I must have been a good boy this year because, after breaking a strap off of my cycling shoe, Santa Claus surprised me and brought a new pair of road shoes from Pricepoint.com: the Sette Elite Carbon shoe (MSRP: $210, PP.com: $89.98). The new Sette Elite Carbon Road Shoes with their ultrastrong and ultralight carbon fiber sole providing excellent stiffness and torque transfer. Not to mention the four air vents in the toe and midsole combined with a breathable mesh upper to ensure your feet remain cool and comfortable all day. 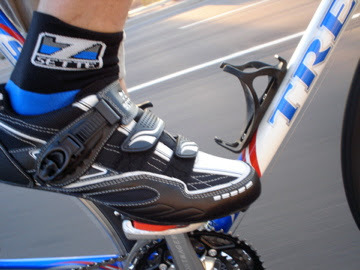 The Elite Carbon Road Shoes feature a premium fit and support that is provided by a molded heel cup and two hook and loop straps combined with a quality metal ratchet closed tab with quick release for easy adjustments. I am young, and not rich, so this is a pretty fancy pair of shoes for me. My only other pair was bare-bones compared to the Sette Elite Carbon, so it might take me a while to get used to a better shoe. 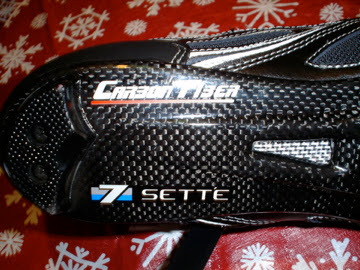 The Sette Elite Carbon comes with a 2 strap and 1 ratcheting strap design, allowing for a nice, snug fit – as long as you are not in a hurry to get the shoe on as quickly as possible (it’s the triathlete in me…). The buckle is easy to manage with one hand, both for tightening and loosening, making it easy to get on and off. It also seems to be really sturdy and I am confident it would hold up to the stress of use as an everyday commuting shoe. The shoe is incredibly comfortable – with no pokes or scratches on the inside – and good looking. There is a neoprene (or something like it) tongue that provides a really snug yet comfortable fit to the top of your foot. I bet this material makes the shoe extremely comfortable in the summer when your feet tend to get hot and sweaty. I could not get a feel for how functional the air vents are during my ride today because it was a “room temperature” kind of day: not hot or not cold. I am confident I will get to evaluate their cold-weather comfort in the weeks ahead and will report back with more detail!